The true story of my encounter with my spirit guide who disclosed startling new revelations about the afterlife and the cycle of reincarnation, as he guided me on astral adventures to the Spirit Side and other fascinating places in the Universe. Welcome to my website. I am the author of Dancing on a Stamp, Dancing Forever with Spirit, Dance of Heavenly Bliss, and Dance of Eternal Rapture, my first four non-fiction books about my dialogue and subsequent astral adventures with a wise spirit named Albert who confronted me on the street one day disguised as a homeless man. On that fateful day in 2007 (when I first met Albert) I was still practicing law, but I retired soon after to begin my new mission to propagate Albert’s revelations to everyone. 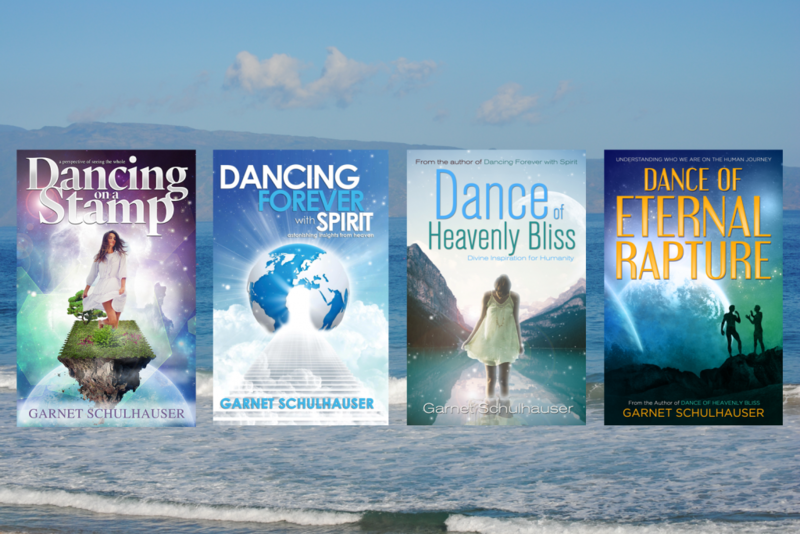 I invite you to read my books to find the answers to life’s eternal questions and learn about the wisdom I received during my trips to the Spirit Realm. Explore my website to learn more about my books and my upcoming speaking engagements and guest appearances on radio talk shows. For your convenience, the left sidebar has links to many popular online stores where you can buy my books. I welcome your comments and questions, which you can post on my BLOG page or email to me at contact@garnetschulhauser.com. For more information about my books and wise spirit Albert, please watch the videos of my talks at the 2013, 2015, and 2016 Ozark Mountain Transformation Conferences found under Conference Presentations and the recordings of my guest appearances on radio talk shows under Radio Recordings, or by accessing my page on YouTube. Book videos can be viewed by clicking on the book titles on the left sidebar. Garnet Schulhauser was interviewed by Will Smith on Citizen’s Forum on December 18, 2018. Garnet Schulhauser was interviewed by Jonny Enoch of MetaphysicalSource.com on October 16, 2017. I am a certified Level 2 Quantum Healing Hypnosis Technique ℠ (QHHT®) Practitioner and accepting bookings for QHHT® sessions. QHHT® is an advanced hypnotherapy technique developed by Dolores Cannon. It uses past life regression and contact with a client’s Higher Self to reveal the answers sought by clients relating to life purpose, career path, relationships, health issues, phobias, connections to people from past lives, and anything else the client is curious about. For more information about QHHT® and what it can do for you, and to book a session, please visit my QHHT® website: www.garnetschulhauserqhht.com. I am now offering Spiritual Guidance Sessions by phone or by Skype. In these sessions I will provide guidance and advice based on the spiritual knowledge I have gleaned from my dialogue and astral travels with my spirit guide, Albert. For more information about Spiritual Guidance, and to book a session, please click on the Spiritual Guidance tab.